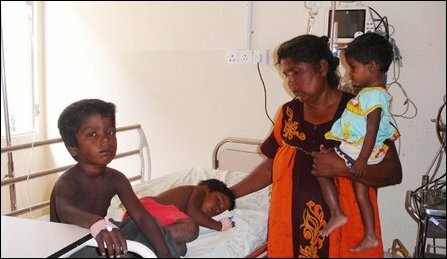 Four children in a family displaced from Periya Pa’ndivirichchaan in Mannaar district due to Sri Lanka Army (SLA) offensives and presently lodged at Ki’linochchi Mu’rippu School are admitted to the Intensive Care Unit (ICU) of the Ki'linochchi hospital Wednesday morning. The children had eaten rice cooked Tuesday noon for breakfast Wednesday, hospital sources said. Four children are admitted at Ki'linochchi hospital. The children admitted to the hospital are P. Koneswari, 12, P. Puvithira, 06, P. Thayanantharajah, 04, P. Kalki, 18 months old. The father of the children, V. Puvenenthiran is originally from Pa’ndivirichchaan in Mannaar district. Puvanenthiran first displaced form Pa’ndivirichchan with his family had sought refuge in Madu first and then fled to Thadcha’naamaruthamadu and from there to Periya Madu. Again the family had to move to Ve’l’laangku’lam where SLA fired shells fell and exploded. The next place of refuge to which the family fled was Aanaivizhunthaan in Ki’linochchi district. The IDPs staying in temporary shelters in Aanaivizhunthaan, Vanneariku’lam and Akkaraayan Hospital surroundings had to flee again to escape being killed in SLA artillery barrage and rocket launcher fire. The sixth place to which Puvanenthiran’s family had come to seeking safety from the SLA attacks Tuesday is the Mu’rippu School in Ki’linochchi area where the children had eaten rice gone rancid out of hunger. SLA continues to launch artillery barrage since Tuesday 12.20 p.m on Aanaivizhunthaan area in Karaichchi Divisional Secretary area and the entire IDPs population staying there are fleeing from there to save their lives.